Probably my least favorite error in Final Cut Pro 7 (or earlier versions) is a General Error. It has one of the least helpful warning dialogs and is frustratingly difficult to solve. However, I’ve learned that when a General Error occurs it is almost always related to a bad clip, or a bad render file, in your sequence. Maybe not always, but this should be the first place to check. General Errors most often relate to render problems; either when you are rendering directly during editing, or rendering as part of an export. While there isn’t a fast way to fix this, it can be fixed. Before you attempt to fix a General Error, it doesn’t hurt to reset your system by doing a Safe Boot. 1. While Final Cut SHOULD be able to work with video of different frame rates, it can often have problems when a clip with a faster frame rate (say, 30 fps) is put into a slower sequence (say, 23.98 fps). Disable clips with different frame rates and see if the General Error goes away when you render. NOTE: To disable a clip, select it and type Control+B. A clip changes color when it is disabled. 2. It is possible that a specific render file became corrupted. This isn’t your fault, every so often it just happens. Delete all render files and see if the error goes away. NOTE: To delete all render files associated with a track, turn off the green visibility light, located in the track header on the left of the Timeline, then turn it back on. This is just a quick click – click. If you don’t turn the visibility light back on, all clips in that track become invisible. 3. Sometimes clips downloaded from stock image houses are corrupted during the transfer. Disable any stock shots (select the clip and type Control+B) and re-render. NOTE: The easiest way to render a portion of a project is to select the clips you want to render and choose Sequence > Render Selection. 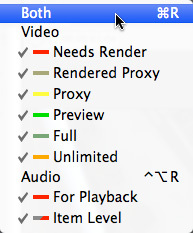 Make sure all the render options are checked, as they are in this screen shot. Repeat this process until you find the section that causes the error. 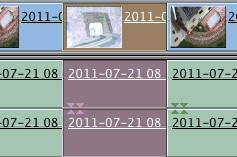 Now, render each clip in that section until you find the offending clip. In almost all cases, you’ll need to remove the clip causing problems and replace it with a new version. Solving a General Error problem is possible; it’s just time-consuming. This gives you some tips on where to start. Thank you for being so helpful. Question… After taking my IMac to the shop to get a new optical drive put in, all the sudden my last two projects get general error files…..is there a connection here? Hmmm… adding an optical drive should not cause general errors, unless the installers made changes to your OS. I’d suggest contacting both the installer and Apple Support. Thank you Larry will do!! Generally, General Errors are caused by either bad media (mostly), corrupt projects, or bad FCP 7 preference files (every so often). Try transcoding the media file that is causing the crash and see if converting it to, say, ProRes 422 solves the problem. If that doesn’t work, you may have a corrupt project. Make SURE!!! that project files don’t exceed 100 MB in size. Do a Save As to create a backup, then create a new sequence and copy/paste clips from the old sequence to the new. thank you this is codec problem. Getting a general error message. Was dropping frames so I went to “Safe” mode for video playback. It made me render .mov files and still drops frames. Most often, dropped frames are caused either by a hard disk that is too slow or a video codec that is too complex for your system to render. Since you have already rendered your media, the first place I’d look is the speed of your hard disk. Different video formats have entirely different bandwidth requirements. Working on fcp7. Large project is completely rendered. During playback the audio is fine but the video on certain clips will play in double time. when the video finishes I get a black screen until the audio finishes. Thoughts. Corrupted files in project? Hmmm… either corrupted media files or corrupted render files. I’d blame render files first. i want to buy FCP 7 Full Video Tutorai. And change the Software popup menu at the top to Apple > Earlier versions. 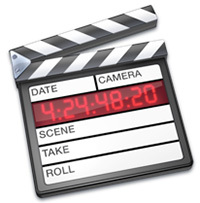 This will display all my FCP 7 training. i was using fcp 7 … with the mxf files directly on the timeline with the help of some calibrate software… but after some time my timeline starts freezing… help me out. Seeing as FCP 7 does not support MXF files natively, you might have more success converting them to ProRes 422 files. Under most circumstances there would not be a loss in quality, while there WOULD be a significant increase in editing efficiency.